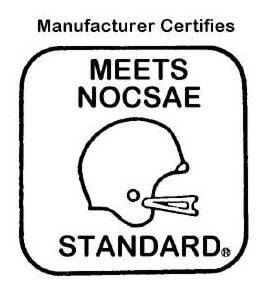 Certification of athletic equipment to NOCSAE standards is managed by the Safety Equipment Institute (SEI), an independent, ANSI/ISO 17065 accredited certifying body. SEI is a private, non-profit organization that administers a non-governmental, third-party certification program, tests for public safety, and certifies a broad range of safety and protective products used occupationally and recreationally. SEI is a subsidiary of ASTM International. 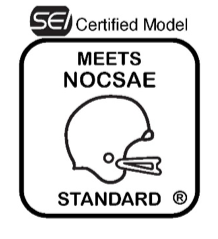 SEI oversees the NOCSAE standards certification process through several accredited, independent laboratories that are responsible for testing to determine if products meet NOCSAE standards. SEI also conducts regular product testing and on-site quality assurance audits at each NOCSAE licensee’s production facilities to ensure continued compliance. Manufacturers seeking to certify their products to NOCSAE standards will need to submit necessary testing fees, product testing samples, product labels, quality program manuals and other required materials to SEI. Manufacturers also will participate in a quality audit and review protocols for responding. Note: Athletic equipment certified prior to 2015 will have the former logo that is still recognized as being certified to the NOCSAE standard.